Wrong Era… Wrong Ice Cream… but Hey – It’s ICE CREAM! It was my turn to cook. I made a rather passable broccoli and cheese stuffed meatloaf, served up with home-grown potatoes (that I growed my own self!) and a can of corn – I don’t grow corn, canned or otherwise. Ruby magicked up her most excellent coleslaw at my request. I have the recipe she always used in the restaurant, the one her clientele begged for, that she adamantly refused to divulge. I can proudly say she divulged it to me – albeit, the “smallerized” version, as I doubt I could give away 250 servings, let alone sell ’em – but I’m ashamed to say that my version just doesn’t measure up to Ruby’s. Therefore, she makes the coleslaw. Ruby, who knows the cadence of every knock that everybody knocks on her door, assured me that no, it wasn’t Yackety-Yack. “That’s Jonty and Eustacia, I’ll bet.” And of course, she was right. Now you know those aren’t their real names – at Ruby’s request, every friend and relative written up here is camouflaged. I use an online name generator when I need a pseudonym for any of her people, but these two names take the cake! And yet, I’m going to use them, because it suits them. I can’t remember if Jonty is a nephew, or if Eustacia is a niece, but I’m fairly certain it has to be one or the other. Either way, they’re both a hoot. Until I’d generated a new moniker for him, I always thought of Jonty as the One-Armed Man, because… well… he’s only got the one arm. Truthfully, he’s got two arms, but the one ends a little short – just above the wrist – he having suffered an industrial accident at some point in his life, if I’m not mistaken. I shall have to get that story out of Ruby someday; it’s bound to be a corker. Eustacia, now… she’s the sweetest thing alive. She and Ruby get yakking, and I get all kinds of tidbits out of them. Tonight I heard about the Jehovah’s Witness that knocked on some great-aunt or grandmother’s door back in the 30’s – “Warsh-board Days” back then, as Ruby calls them – and interrupted the lady’s busy day. She was up to her eyeballs in laundry (on a warsh-board, no less) and she wasn’t much impressed that he was at the door. “I’m sorry – we must be boring you with all these old stories,” she said. Ruby didn’t even give me a chance to reply. We talked a little politics, world-peace, the green movement, and how all the foreigners are taking over the Sault. Then they got into the Northland stories, and I heard a new little one about Satch and Katherine, those kids that plunked their pin-money into the coin-operated refrigerator for entertainment. Satch and Katherine were the first of Ruby’s parents’ grandchildren – and oh how Ruby’s dad doted on those kids. When they came to the homestead to visit, he’d pile the kids left at home, plus the two grandkids into the car and take them swimming at Haviland Bay every Saturday in the summer. One the way back, he always stopped at Kirby’s Corners and bought an ice-cream cone for everybody. 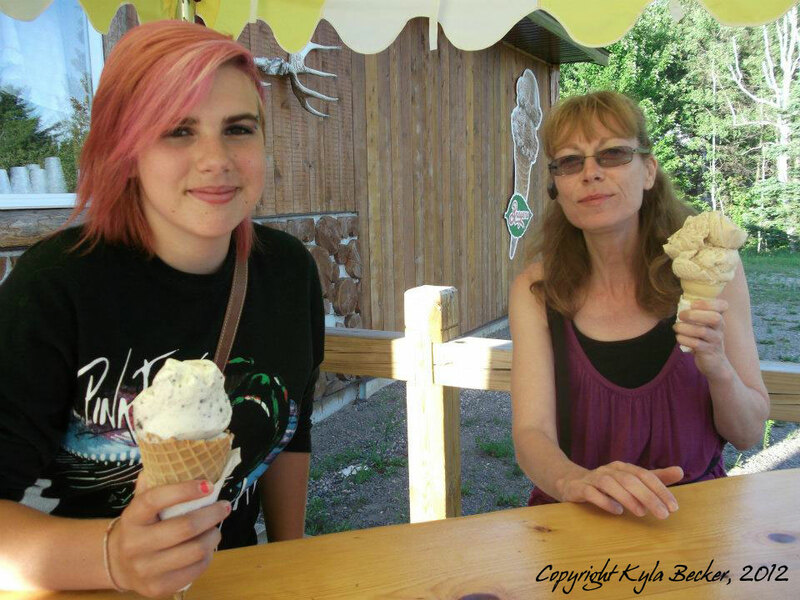 Ruby remembers the first summer that Katherine got a Kirby’s Corners cone – she’d have been about five that year. It took her most of the way home to eat that ice cream, and when she’d licked it down to the cone, she rolled down the window and tossed the cone out into the road. Ruby’s dad couldn’t understand why any kid would waste an ice cream cone in such a way, and he demanded to know why she’d done it.